You probably don´t imagine your open-source project becoming next year´s hottest unicorn. All but the smallest of open-source projects are always at risk of turning into abandonware. You will create a project, and with the time, it will grow, so too will the demands it places on your time and finances. That is exactly the moment when you will have to make a choice: either abandon the project you started completely and hope that someone with more resources successfully brings it back or begin to explore different business models that could provide the resources you need. In this post you will read the three most common business models for a web-based OSS projects, without comparing them to another. I would like to highlight the details you need to consider before deciding on which business model you might want; so although I won´t argue which model is the best, I will take care of the points you need to look at. Defining success is problematic because although in simple terms it is the achievement of an aim or goal, what that aim or goal is, is unique to each person or organization. As a developer, you must decide what success means to you. The key strategy to follow when choosing or creating a business model is keeping it familiar. Don´t be afraid to mix and match elements from the different models, but take care of trying to create something completely new. Your clients are more likely to convert if they understand your model and your plans, and it looks somehow similar to what other companies offer. This model sees your software provided as a centrally hosted service, and it is only accessible via a paid subscription. Subscriptions are usually user, transaction volume or time based. This model has the software still completely open source, and freely available to all customers, but services such as consulting, installation, support (basic and/or priority) and training are only available at a fee. Consulting services usually cover the management and implementation of the software within specific industries. Vtiger CRM is an example of this model being used successfully. Vtiger is supported by a vibrant community of thousands of businesses, hundreds of thousands of users and countless developers. 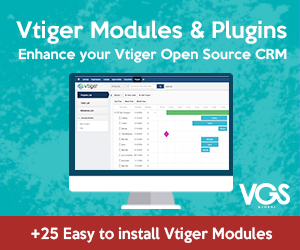 Vtiger´s free open source CRM ranks #1 in total downloads on SourceForge. This model is similar to the Professional Services model in that the core software remains open-source, and continues to be developed. However, special features and modules that extend or enhance the core product are only available as a commercial software, for a fee. Talend uses the open core model to sell value added features for its core modules. Choosing the right business model is no simple task, and knowing that your clients won´t tolerate a big change to your model doesn´t make it easier. No model will be perfect from the beginning, but although small amendments and adjustments are fine, changing to a completely different model later on will put your entire clients at risk. Remember to keep the whole process familiar and easy, for your customers, not for you. You can look at our project as a business model, but they should see it as simple as a solution to their problems.